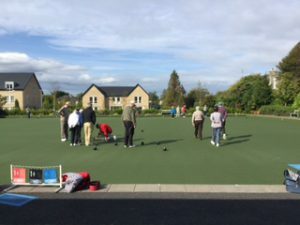 Dun Laoghaire Bowling Club hosted their annual Coffee Morning in aid of Blackrock Hospice on Tuesday 19th September. Had a great game of bowls before a lovely cuppa and yummy cakes and we also had a Raffle. The total money raised for the .Hospice this year came to €1,055. Many many thanks to all our members and friends. Congratulations to John Byrne & Noeleen Kelly, both of Crumlin Bowling Club, on their respective wins in the 2017 Champion of Champions.